Learn riding skills in a fun, relaxed and supportive atmosphere. We offer comprehensive one hour western riding lessons with a max of 6 riders per group. Lessons go beyond riding to include components such as how to catch, lead, groom, tack up, ride and care for your horse. Our instructors and assistants will guide you through the process, emphasizing safe horse handling practices both on the ground and in the saddle. Participants register for a session option: Saturday or Sunday. A riding assessment determines skill level, participants who have done lessons with us in the past year do not need a riding assessment. Participants are grouped according to their skill level to ensure a consistent riding experience. Once assessed they are assigned a specific riding time within their session option. For example, riders session option is Saturday, after assessment, rider is assigned to 10:15-11:15 a.m. based on skill level. Friend requests are not guaranteed for horse riding lessons as participants are grouped by skill level. Select your session option, attend the corresponding skill assessment and your child will be assigned a group riding time. If you are unable to attend your assessment date/time please contact Kit Swanson. Assessment needed for our new riders. Below you will find what will be covered in lessons and provide a few great videos to review to prepare for lessons! Please review the lessons before each riding session (ie. before the first lesson, please watch lesson 1 videos). These videos are to prepare the riders for the lesson, give them a basic understanding of what they will be working on their lessons. More will be added as the weeks continue. The first part of Lesson 1 will focus on Catching, Haltering, Saddling, Bridling, and Horse Care. These foundations will be used for every lesson, students will be expected to catch, halter, saddle, bridle their horses before class; and unsaddle, brush off, and ensure their horses have water and feed after class. 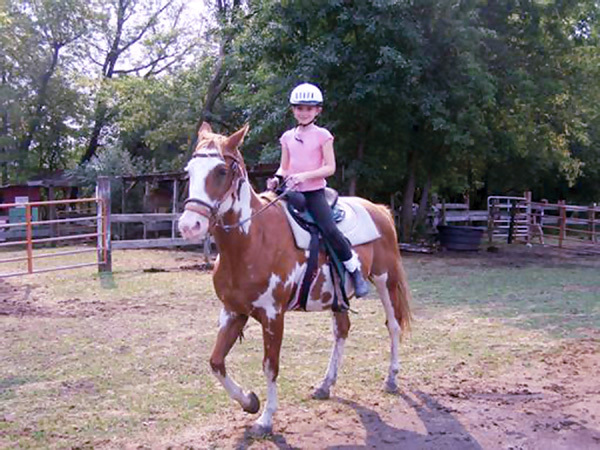 Riding Instruction will cover holding the reins (hands), leg cues, and seat. How to Catch, Halter and Lead Your Horse: Please remember to ask if you are having problems catching your horse, as some of them can be a little difficult to catch, horses will be in holding pens in groups of 3 or less. Tying the Cinch: This video shows how to tie the saddle knot and also shows how to latch or buckle the cinch. Either way is good for class, most of our tack is going to require you to tie the knot. Bridling Your Horse: Note most of our bridles do not have throat latches, so this step is not necessary. Mounting and Seat: This is a very long video and could be a bit boring, but mainly focus on rider alignment in the saddle mounting. Using Your Legs- the basics: In lessons we are going to emphasize the use of your legs while riding, we are going to go beyond "kicking" our horse to move forward to learning to squeeze and use our legs properly to advance our horse. Lesson 2 will continue to focus on Hands, Leg Cues, and Seat. 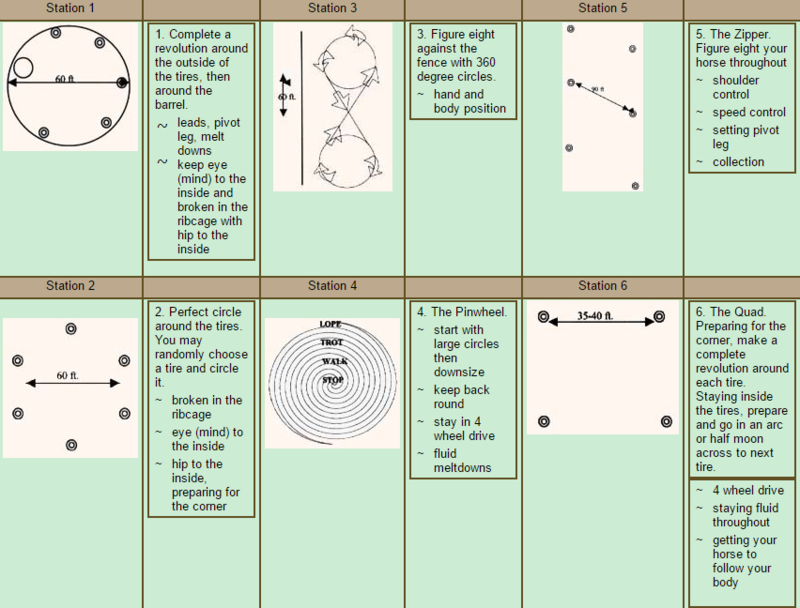 This will progress to controlling our horses movements and performing pattern skills. Common Mistakes: Great demonstration on how to hold your reins and also seat position. Body Language: Our horses are smart! They can tell what you want from watching (or feeling while in the saddle) your body position! Steady Reins: Stopping our arms from flapping like wings when riding. Riding the trot: Keeping your seat in the saddle when riding. Trail Riding: Riding outside of the arena is different than inside the arena. Focus on "sit, look, turn". Working drills to enhance forward movement within our turns. Control at higher rates of speed. Here are a few drills that we will be working on in lessons 3 and 4!